How's This for a Windows Phone? "...Fujitsu and DoCoMo are teaming up to unleash a dual-boot device this year that can go from Windows 7 (the desktop OS, not WP7) to Symbian at the flip of a switch." 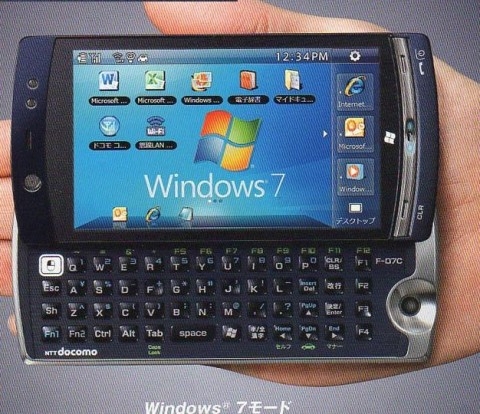 If this is real, I suppose this could qualify as a "Windows Phone". With an Intel Atom CPU, a 1024 x 600 resolution screen, and 32 GB of storage, the specs do make it stand out. Oh please DON'T let this be true. We've already seen that "Windows on a phone" just doesnt work. Pocket PC proved that. If theyre calling this a Windows phone, it causes confusion with Windows Phone 7. That's the last thing they need - we've got rhe developers-developers-developers, so now its time for the the mindshare-mindshare-mindshare.